When Mr. 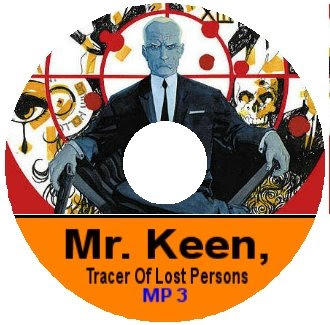 Keen, Tracer of Lost Persons first debuted over the Blue Network on October 12, 1937, the show’s title accurately described Keen’s stock-in-trade; the “kindly old investigator” tracked down individuals who had mysteriously vanished, leaving behind their families, homes, jobs and other day-to-day activities. Keen (he never had a first name, unless it was “Peachy”) was assisted in these duties by an Irishman named Mike Clancy. Mike wasn’t much of a brainiac (the quote that comprises the title of this post was a semi-catchphrase that he seemed to use on the show every week) but he could use the necessary brawn when the situation called for it. Bennett Kilpack played kindly ol' Keen throughout most of the program’s run, as well as Philip Clarke and Arthur Hughes, while Jim Kelly took the role of Clancy. The series originally aired as a thrice-weekly fifteen-minute serial from 1937-43 (the show moved to CBS in 1942), providing more than ample time for Keen to solve even the most baffling of disappearances. Beginning November 11, 1943, the program changed its format to that of a half-hour weekly offering—and though the title and theme song remained, Keen branched out into investigating murders. If Mr. Keen, Tracer of Lost Persons sounds a little soap opera-ish, it’s because it originated from the “radio fiction factory” of Frank and Anne Hummert. (Frank received on-air credit for the writing, but the scripts were actually churned out by scribes like Lawrence Klee, Bob Shaw, Barbara Bates and Stedman Coles.) 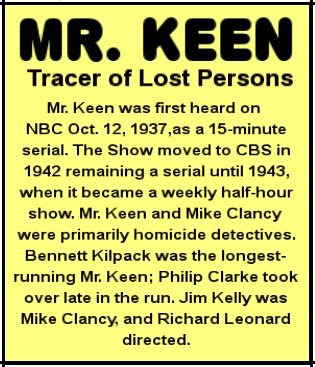 Mr. Keen“ employed all the stereotypes, heavy dialogue, and trite plotting of its daytime cousins” and “it appealed to a lowest common denominator.” So why is the show so popular with old-time radio fans today? Simple…it’s pretty doggone funny, in an unintentional sort of way. Mr. Keen, Tracer of Lost Persons enjoyed a healthy eighteen-year stint over radio, ending its run not—as previously reported on this blog—on April 19, 1955 but on September 26 of that same year. Over the years, the series had a variety of sponsors: Bisodol, Kolynos toothpaste, Chesterfield cigarettes, American Chicle, etc., and there are nearly sixty broadcasts extant today for modern-day listeners to revel in. It’s ample evidence that not every show during the Golden Age of Radio was “golden”—but I gotta admit, it sure is fun.